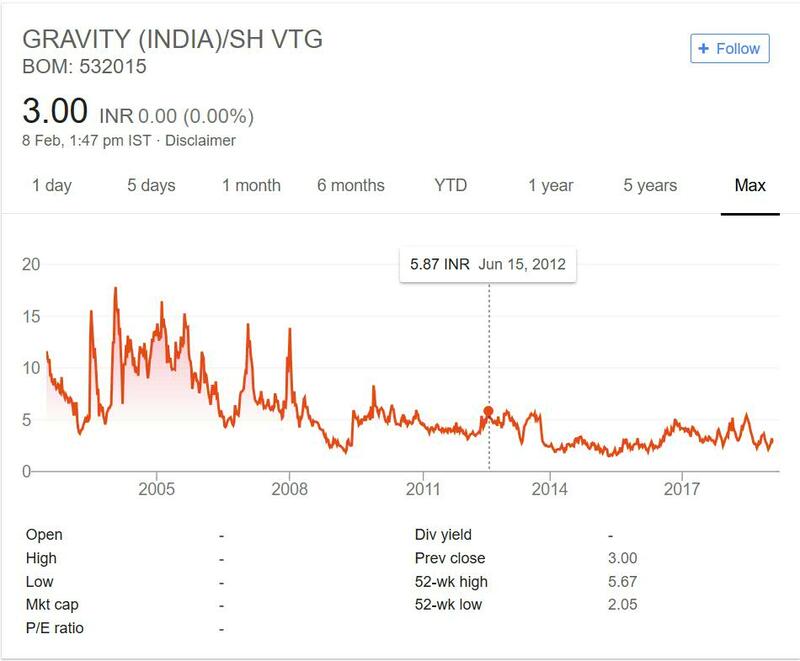 Gravity India Ltd. is in portfolio of Subramanian P. He is one of the top investors in India. It is a Textiles Company. As per Company website it is mainly manufactures the fabrics made 100% Cotton, Newly Home Furnishing Fabric Polyester Cotton (PC), Polyester Viscose (PV), 100% Cotton, 100% Polyester of Suiting Fabrics as well as Shirting Fabrics and also manufactures Industrial Fabric as per the requirement of the customer. As of now it has weaving capacity of 3.5 lakh meters per month. The manufacturing unit is situated in Dadar and Nagar Haveli union territory. It also exports the products to countries outside India notably countries in Middle East Asia and Africa. I do not have to say much after the chart. You can easily make out from the chart. The company has not performed over last 16 years or so. It was trading at 12 INR price but has moved down to 3 INR as of now. So wealth of investors was destroyed by 75% in this time frame. It is constantly under performing in all these years. During 2002 to 2005 period it make new highs. After those golden period as per price performance it never moved higher. With time the price kept making new lows with short bounce back. Gravity India limited is in Textiles sector. I have reviewed many textiles company before. Most of them have under performed over the years. They have not given positive or good return in long term. Gravity India also presents the same fact. It has made investors loss money over the years. As mentioned in previous articles I do not track or invest in Textile sector companies. The reason is competitiveness and problems being single factory based companies. If you are really interested in this sector then select established players instead of small players. It is better to track Textile machinery company rather than Textiles company.